My daughter Anna is the true innovator behind this Valentine decoration. 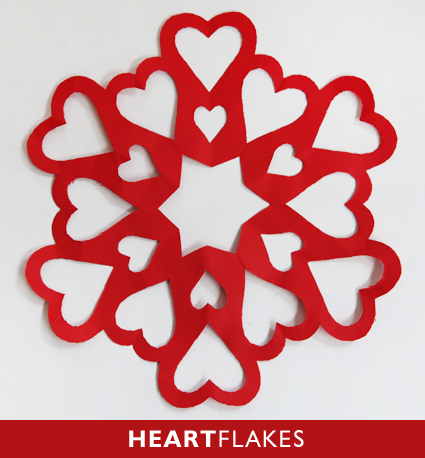 She inspired the project requesting a red snowflake while we were cutting out hearts for other projects around the house. I thought it would be handy to teach her how to cut a heart while also making the snow flake. This was the result. If you’d like to make one at home, all you need is paper and scissors. Try to use the lightest weight paper you can find. You’ll have to make so many folds and cut through several layers at once, so construction paper will be nearly impossible to work with. If you’d like an easy guide to folding a perfect 6-point snowflake, you can follow this link for great instructions. Enjoy and Happy Valentine’s Day! 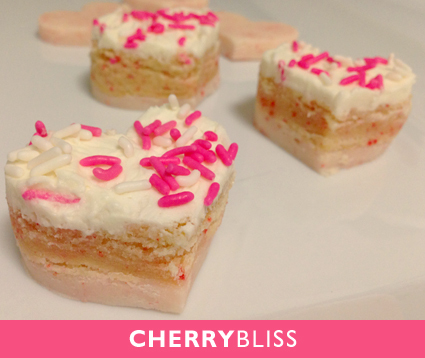 Thank you Pinterest bakers for your inspiration this Valentines Day! After spending a long weekend pouring over endless photos of dessert recipes, layering brownies and cookies in so many inventive ways, I couldn’t help but try a new combination of my own. This recipe gleans from two separate recipes I found this week, one being the best-ever recipe for Cherry Chip cake mix cookies and another ingenious use for cake mix to make white chocolate fudge using cake mix. The original fudge recipe used birthday cake flavoring, so I adapted it just a bit by using the Cherry Chip flavor. The fudge was solid enough on its own that I cut a few extra heart pieces to have on its own. 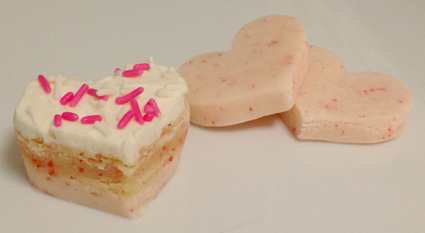 And they turned out really cute and pink for Valentines. I can’t wait to share these with the family tonight! This year my little girl turned 5, and she wanted to play her favorite game pretending to be a cat or a dog with her friends. After a few weeks searching for the perfect party supplies and invitations, I gave up on the big stores and decided to make my own. With a little construction paper and a dash of creativity I am convinced that ANY birthday party theme can be done best when it is home-made. Getting to choose the exact set of colors and design style for the favors made for a super-customezed birthday party experience that matched my little Anna’s style to a tee! Starting with construction paper for the favors and birthday pennant banners to decorate the house, I set the color theme for the party. The next step was making a quick design plan and choosing foods, napkins, plates and balloons that matched. I’ve found that a growing number of party supply stores will carry a good selection of the basics in a wide variety of colors. 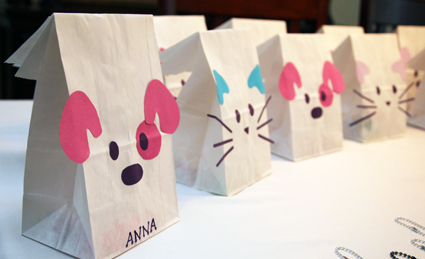 For this party, I chose to have favor bags that looked like cats and dogs, a mask and tail station for kids to decorate and dress-up as their favorite animal, and snack foods labeled as “doggy treats” and “kitty food”. 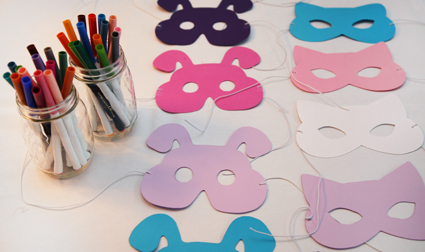 These kitty and doggy tags are made from the same paper that I used for the banners and all of the other party supplies. It made for a very coordinated presentation. 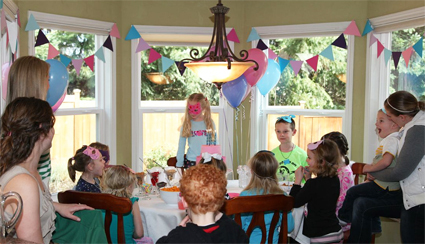 Making your own birthday party supplies is a guaranteed strategy to have a perfectly coordinated birthday party, no matter what you choose to create with them! 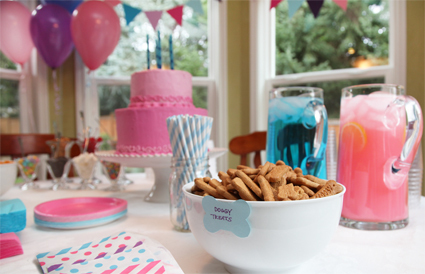 Some of you might be wondering where the designs come from for these party goodies. I spend a few days getting inspired online. I searched Pinterest and did some general Google image searches for cat and dog clip art until I gathered a handful of samples that looked cute. With the inspiration in front of me, I grabbed my pencil and paper and started to draw out my ideas. The next step was cutting paper templates to trace. I have to admit that this step took the better part of an afternoon experimenting with shapes and designs that did’t quite look right. But, a little persistence saw it through. The rest of the process was really fun, tracing cutting and gluing everything together. My kids even got to help along the way, which added to their anticipation of the party. The end result was worth the hands-on effort. Paper, glue, scissors and tape came together to make a birthday party experience that was really fun! 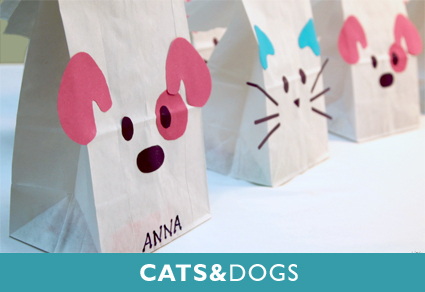 The whole littler of cats and dogs celebrated in masks, tails, and collars while parents and kids alike enjoyed an afternoon of games and birthday treats among the balloons and banners of Anna’s birthday party. 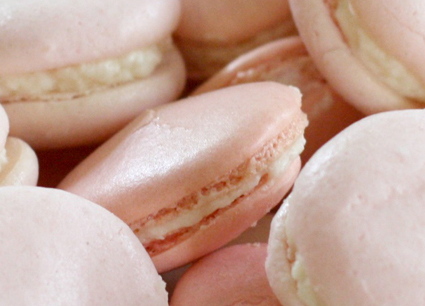 What are macarons, you might ask? If you’ve never had one, stop reading this post. Head immediately for the closest French Patisserie and try one right now. When done correctly, they are the most delicate cookie combining the crunch of light fluffy meringue with a chewy almond flour texture and sweetened by soft creamy buttercream filling. 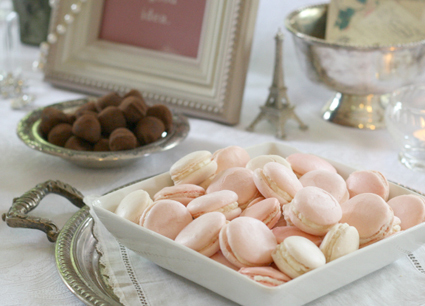 Macarons can come in almost any color or flavor you can dream of, just do a little searching online. These macrons, done in all shades of pink, were a bit of an experiment and a learning exercise for my very trusting girlfriend who let me make them for her French-themed baby shower. Fortunately, what they lacked in uniform structure and beauty (thanks to my lack of experience and French baking finesse) they made up for in great flavor and texture. It also helps that my girlfriend is a very talented photographer, designer, and has an eye for making everything beautiful. She took these photos and really made them look amazing. If you’r just getting back from the bakery with your macaron, you must also take a minute and visit her site, Grace & Ivy. Soak in the beauty of her stories and photography of French-inspired vintage collectibles. 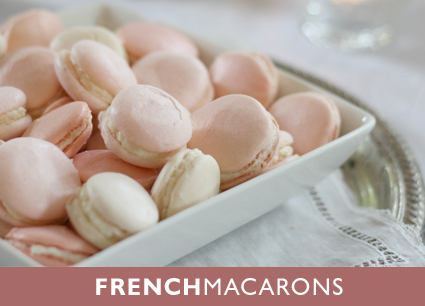 If you are new to making macarons, the batter is a combination of an egg white meringue with sugars and flours. It is very delicate and can easily be disturbed. This often translates to bad results in the oven such as cracked tops, flat cookies, over baking and browning, raw centers or a host of other things that might leave you wanting to throw out the whole batch and start over. That said, the results are so tasty they are worth the effort. Here is a good basic recipe and a few tips I discovered along the way. You can see the imperfections, but they are trying to be good macarons! TIP #1: Weigh your ingredients to prevent the mixed results you might get from differences in egg sizes, humidity, and the way ingredients might be packed or scooped into a measuring cup. TIP #2: Have all of your ingredients fully warmed to room temperature. The eggs will hold their structure much better once they are whipped. Make the meringue: Whip 60g egg whites in a free standing mixer until soft peaks form. Meanwhile, heat the sugar, water and vanilla extract in a small saucepan over medium heat. Using a candy thermometer, stir and heat until the mixture reaches 140 F. Remove it from the heat immediately. Begin to mix the egg whites again at medium speed and slowly pour the sugar mixture along the side of the mixing bowl until it is fully incorporated. Turn the mixer speed to high and whip until thick glossy peaks form. TIP #3: Mixing long enough to get stiff, glossy peaks to form the meringue is critical to getting stable, fluffy cookies. Otherwise, the batter might be too gooey and sticky to rise or come off the baking sheet later on. Make the flour: Combine the almond meal and powdered sugar in a food processor and blend until the mixture is smooth. ( You can sift the ingredients together instead, but the food processor is much faster. ) Once blended, add the remaining 60g of egg whites and stir until a smooth creamy batter has formed. DO NOT whip these egg whites. If you’d like to add color to the batter, add it here and combine until fully incorporated. Finish the batter: Start by adding one scoop of the meringue to the almond/sugar mixture. Gently fold it in until just incorporated. Add the rest of the meringue and gently fold in until the batter just barely drizzles smoothly off the end of a spoon. Make the cookies: Transfer the batter to a piping bag with a large round tip. Make quarter-sized dots on a baking sheet lined with parchment paper or a Silpat. Let the unbaked cookies set out for one hour until a dry skin forms. (This will prevent cracking and make a nice smooth surface as they bake). Bake the cookies at 275 degrees for 5-7 minutes. Rotate the baking sheet and bake for another 5-7 minutes and remove from the oven. Do not let them brown. Once the cookies have cooled for a few minutes, they should come off the parchment paper if gently pulled by hand. Using a spatula might damage the delicate texture of the cookie. TIP #4: Drying the cookies is a critical step that cannot be skipped. It will make all the difference in the shape and texture of the cookie. Final Assembly: Sandwich the cookies with a buttercream frosting or pastry filling of your choosing. The cookies can be stored in the fridge overnight and served the next day. They also freeze beautifully for a couple of weeks. To celebrate my girlfriend’s birthday and the advent of Spring, I went to the light and healthy tastes of angel food cake and dressed it up with a very simple whipped cream frosting. 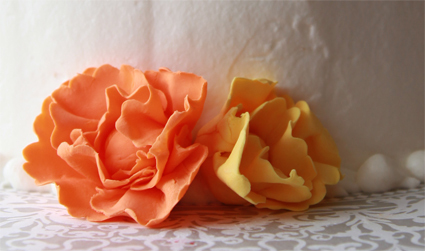 A few delicate gum paste flowers created some interest with punchy colors and delicate textures. The design: It took a while to think of a design that took the cake beyond the single-layer bundt shape the cake is baked in. I wanted this to look like a birthday cake and not a dessert dish for a summer barbeque. To change the shape a bit, I stacked and layered two store-bought angel food cakes. I had to trim the sides to make the cake nice and straight. Not wanting to fight the delicate flavors of the cake, I also didn’t want to weigh the cake down with traditional buttercream frosting or fondant. This cake is covered in a light whipping cream frosting. Wanting to add a delicate vintage touch to the cake, I made a few quick gum paste flowers by rumpling circular-shaped cut outs and bunching them around a small round ball-shaped center. Building the cake: I was delighted to find the angel food cake rather sturdy and resistant to tipping or collapsing with all of the handling that goes with stacking and layering a cake. It held up beautifully. I was also concerned about the sturdiness of the whipping cream frosting. I attempted to thicken a few batches with gelatin and other methods I researched online, but in the end, plain old whipped cream cream sweetened with sugar did just fine. It almost solidified as it was spread on the cake. It also piped very well and showed no signs of drooping. The core of the angel food cake was also an issue. I didn’t want a big gaping hole left in the middle! This cake is filled with plain fresh strawberries, rinsed and dried thoroughly. I was worried about the juices seeping in to the cake, but they kept to themselves nicely for a good 24 hours after the cake was assembled. And they made for a beautiful surprise when the cake was cut and served. Here is a close-up of the gum paste flowers. 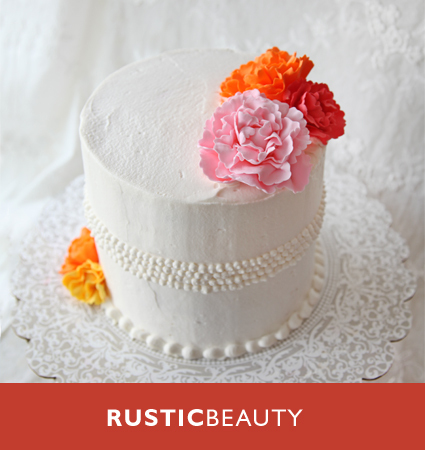 These little details made an otherwise crude and rustic cake look light and delicate. The perfect touch! Some Recipes: Pressed for time, I resorted to store-bought angel food cake, which I now regret. The following weekend I baked one from scratch that was incomparably better in both taste and tenderness. If you’ve never tried to bake angel food cake before, it is a MUST for your to do list this year. It’s surprisingly easy. All you need is the right pan and a few tips for your recipe. - Use an angel food cake pan with straight sides and a hollow core through the middle. It provides the batter lots of surface area to cling to and helps it to grow tall, light and fluffy as it bakes. - Do NOT use cooking spray or butter to coat your cake pan. The batter needs to stick to the pan walls to climb tall and fluffy. You will easily be able to loosen the cake by scraping a knife along the cake pan walls when it is cooled. - Make sure all cake batter ingredients are ROOM TEMPERATURE. I warmed my eggs too much on the first attempt, and they never formed stiff peaks that are critical in a good angel food cake batter. Let your eggs sit at room temperature for 30 minutes or longer and they will whip up beautifully! Unlike the angel food cake batter, this recipe works best when all of the ingredients are very COLD. Refrigerate your mixing bowl and whisk for 15-30 minutes ahead of time to give the ingredients a cold surface to mix against. When chilled, simply combine all ingredients in your mixing bowl and whip until stiff peaks form.